We resumed our GALCIT solid rocket propellant preparation that was started a few days ago. Melting the mixture of bitumen and paraffin oil took around 1 hour at 300 degrees Celcius. This is quite slow because the contact surface area between the melting beaker and the temperature controlled hotplate is quite small. To optimize this, we'll use a crucible with a larger base next time. For safety, a gas mask and protective gloves were worn during the mixing. The gloves are great, they protect from heat and fluids so they are ideal for bitumen. Without them, this would have been a lot more difficult. Once the mixture had completely melted, it was quite runny, quite comparable to molten chocolate. 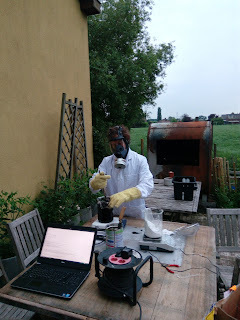 Mixing in the oxidizer was done in open air for safety reasons, again with protective gear. The large volume of propellant in comparison with the small surface contact area with the hot plate meant it was difficult to keep the GALCIT hot enough. And since the oxidizer has quite a high heat capacity (111.35 J/mol·K), every time a quantity of the oxidizer was added, the mixture would cool down and stiffen up. Also the volume would increase, so the unfavorable volume/contact area would worsen at every increment. In the end, we divided the 2l mixture over two containers and continued with 1l of volume. That resolved the heating issue and allowed us to finish up our first liter of GALCIT. 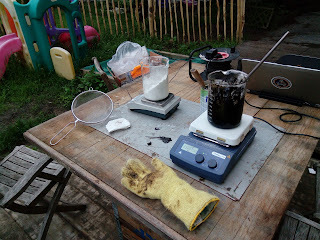 The final GALCIT mixture is quite viscose (similar to wet clay) and very sticky. The viscosity of GALCIT was too high to allow pouring it directly into our cardboard test engine tubes but it was easy enough to scoop it out, smear it into the tubes and pack it together with a stick. We filled up 3 cardboard test engine tubes that had a clay stopper on the bottom, those still need to be reinforced, fitted with an ignition and nozzled up. To avoid pockets of air in the propellant, which would dramatically increase the surface area, we just tried to pack it tightly. In the future, we might need a better way to ensure no bubbles get trapped inside to ensure a continuous burn. Since we had a bit of GALCIT left, we decided to do a small test to see whether we could get it to ignite at atmospheric pressure with 10 grams of (relatively poor quality) black powder that we made on the side. We placed around 14cl (around 300g) into a small ceramic bowl and poured the black powder on top. This batch of black powder did not easily ignite when placing a burning cigarette into it, although the previous batch did. But that wasn't unexpected, considering the poor quality of the black powder. Luckily, we had a solid plan B for igniting the black powder and the GALCIT, using a simple hand-held propane blow torch. The blow torch did the trick. We were surprised of how well GALCIT burns at 1 bar, considering it burns optimally at 70-140 bar. A total burn time of 45 seconds is huge for such a small amount of GALCIT. It means the burn rate was very slow, about 0.27 mm/s. Consider the excessively high burn rates (~ 36.5 mm/sec) that have been reported and large burning surface area, estimated at around 40 cm3. Yet this is to be expected, due to the low atmospheric pressure at which the burn occurred. GALCIT has a very high pressure exponent so the burn rate increases dramatically with the pressure. So the time has come to test the propellant at a higher chamber pressure!